Walk through the shop and touch some flat, horizontal surfaces. If your fingers leave even a small a track in the dust, you have a problem. It’s sometimes called migrant or “fugitive” waste. The American Heritage Dictionary defines dust as “a cloud of fine, dry particles.” But woodshop owners know better. It’s not just airborne: it’s an insidious coating, a thin blanket that affects everything from finish quality to employee health. And in an industry that is centered on flammable materials and byproducts, dust also carries potential for both fire and explosion. Dust is the enemy and it must be contained. Woodshop owners have always understood that dust is a threat. Before sprinkler systems and spark detectors, the main concern was fire. Today, we are perhaps more worried about the pulmonary and carcinogenic health of our employees and ourselves, but fire is still a valid issue. 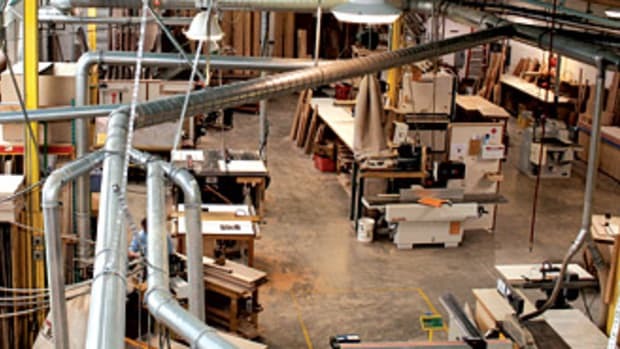 The National Fire Protection Association has developed a comprehensive library of information for many different industrial sectors, among which are woodshops. NFPA Publication 664 (available online at www.nfpa.org) describes how to prevent fire and explosion in facilities that process wood or manufacture wood products. It’s worth reading through and possibly requiring supervisors to do the same. Among the elements the NFPA stresses are compartmenting, which addresses ways to contain wood dust fires before they start; means of egress so your people are not at risk; and control of ignition sources so fires never get started. Those three elements need to be part of any comprehensive approach to dust collection. They highlight the danger of fire, but they also address employee safety and quality-control issues. And they are only part of the picture. A dust collection system isn’t just hoses and vacuums. It’s also a collection of practices and routines that together can reduce and even eliminate many of the hazards of dust accumulation. There are more elements to consider here than just ductwork and bags. 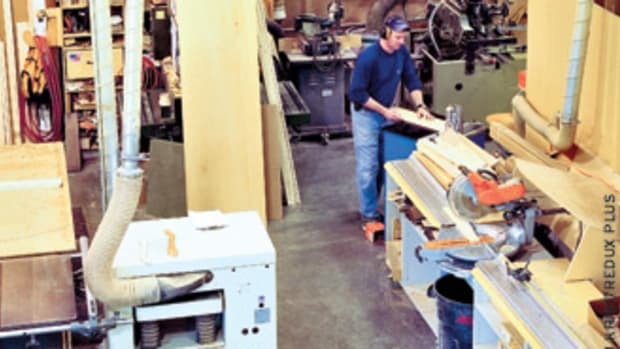 One good place to start when formulating a shop policy on dust collection is to download a free PDF offered by the Canadian organization WorkSafeBC (www.worksafebc.com). The booklet is titled “Combustible Dust in Wood Products Manufacturing: A shop floor guide for employers and supervisors”. The organization itself is a British Columbia statutory agency that is funded by insurance premiums paid by employers. WorkSafeBC is responsible for administering the province’s workers’ compensation act. As one might expect, it isn’t exactly a light read. But it does cover the issues in great detail. Among the topics addressed, for example, is the manner in which combustible dust differs from other wood dust. 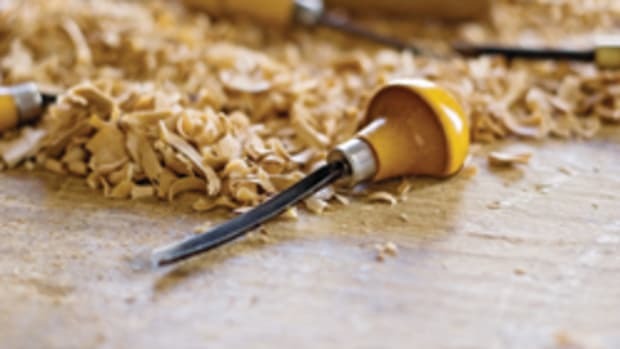 The publication also outlines ways in which a woodshop might create and use a combustible wood dust management program and then details what is involved in standard housekeeping. It gives examples of ways to control and eliminate ignition sources and guides shop owners through a process to discover where potentially harmful wood dust might build up unseen in the workplace. The word “housekeeping” as used by WorkSafeBC doesn’t just mean routine cleaning: it also refers to dust inspections, reacting to changes in the volume or types of dust being generated and conducting preventive maintenance to reduce a shop’s exposure to accidents and poor health. And it stresses that even emergency preparedness should be part of the dust collection system. For example, do your shop-floor people know what to do in the event of a wood dust fire before emergency crews arrive? Will they try to fight it? Should they? Will the steps they take aggravate the problem? Will they open or close doors and add to the amount of air available to the fire? Should they close down ductwork that might act as a corridor for heat and, if so, do they know how to do that? Letting people know what to do before it happens can save lives and the woodshop, too. But before you get to training, you have to gather the dust. Designing a comprehensive dust collection system begins with understanding what it needs to handle. Every material generates different types of waste and both the chemical composition and physical size of the grains will determine the volatility and toxicity of any residue. In other words, you need to know what kind of dust you’re making — and how much — before you can have somebody design extraction and filtering mechanisms. There are dozens of competent suppliers online where a shop owner can go to size a new dust collection system, or assess and modify a current one. Engaging an expert, even for a one- or two-man shop, is a wise decision. It’s crushing to install a new system and almost immediately discover that it’s undersized or inefficient. Most suppliers have design experts on staff and many offer free design services. Another reason to engage a professional is that no two shops are identical, so every dust collection system is actually a custom design. For example, some shops process mostly solid hardwoods, while others work almost exclusively in MDF or plywood. The first step, therefore, is to audit the shop’s existing and proposed waste, in terms of both composition and volume. These numbers will never be precise, so what you’re looking for is an educated estimate. A good place to start is to take a hard look at the makeup of the company’s COGS (cost of goods sold). Your accountant can review this and give you a pretty good picture of what kinds of materials the shop has used in the last few years and how much of each. A good set of books will show how much plywood, plastic laminate, fiberboard, solid wood by species and other raw materials were purchased, inventoried and processed. The results of such an audit might be surprising. Next, the way that these materials are processed needs to be examined. 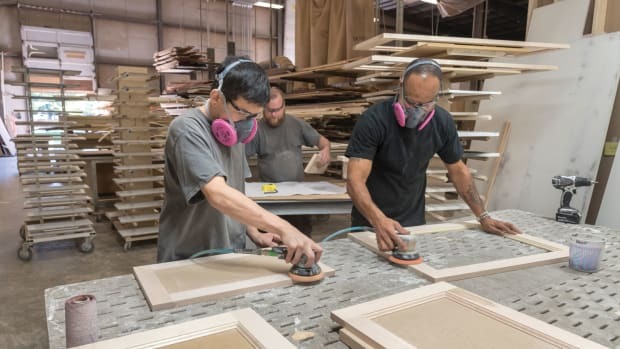 If a shop outsources part or all of some steps such as sanding (as it would do if it buys in pre-sanded or finished custom doors) or CNC milling, that will impact the amount and type of waste being generated. Shops that hire a service to dispose of dust can review the history of collections and see how many cubic yards or other volumes of waste were processed. The bottom line here is that one doesn’t have to make completely wild guesses about current or projected volumes and types of dust. There are enough sources of information available to reduce those numbers to fairly reliable arithmetic. Once a shop owner knows how much dust is being generated and the nature of it, he or she can approach a planner and design a system to collect it. The shop can also begin to look at alternative ways of disposal at this stage and some of these could have a direct impact on profitability. Instead of paying to bury waste in a landfill, perhaps it can be sold to the manufacturers of wood pellets, particleboard, fiberboard, chipboard or hardboard. Depending on its constitution, there might even be a way to market waste as animal bedding, landscape mulch or as an ingredient in commercially manufactured compost. There’s a process that reduces wood waste to charcoal and then combines it with organic waste to produce fertilizer. The issue of migrant (or fugitive) dust is a big one. This is dust that escapes the collectors and accumulates throughout the shop, often in places where it is unseen and unnoticed. One example of this relates to lighting. As incandescent bulbs gradually disappear, lots of shops are finding that compact fluorescent (CFL) replacements don’t deliver the same amount of light or take too long to warm up. So, some woodshops have switched to halogen, sodium and other lighting options that burn faster and brighter. But, unfortunately, that often means they also burn hotter. Consequently, fine dust accumulating on top of some light fixtures is a hazard, so lamps need to be periodically cleaned. Switching to LED bulbs might also be part of the solution because they supposedly run cooler than CFLs. So cleaning the tops of lights and changing to different bulbs can actually become part of a woodshop’s dust collection system. But the real point here is that there shouldn’t be any dust on top of those lamps in the first place. Where did it come from? The Environmental Protection Agency defines fugitive dust as “emissions of solid, airborne particulate matter which could not reasonably pass through a stack, chimney, vent or a functionally equivalent opening.” In essence, they’re saying it wasn’t evacuated from the building through burning. 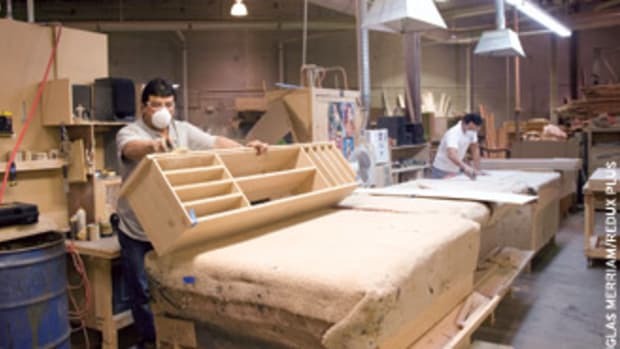 The term “migrant dust” is perhaps more appropriate to woodshops: it describes dust that was introduced within the enclosed environment of a building and was not collected at its source. It then moves (migrates) through the building using air currents created by heating and air conditioning systems or is carried by static attraction on the outside surfaces of metal dust collection ductwork. It can travel in air dispelled by pneumatic tools or even hitch a ride on clothing. 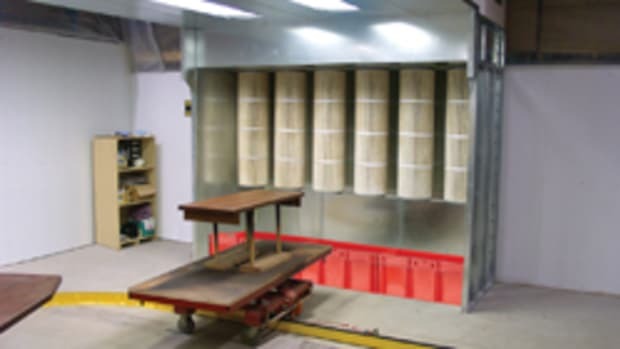 Every time something in the woodshop is disturbed (such as a dust collector bag starting up or someone removing a sheet of plywood from a stack), fine dust once again becomes airborne and migrates around the shop. The only ways to eliminate it — or at least reduce it to harmless inconsequential levels — are to gather it at its source and perform routine cleaning. 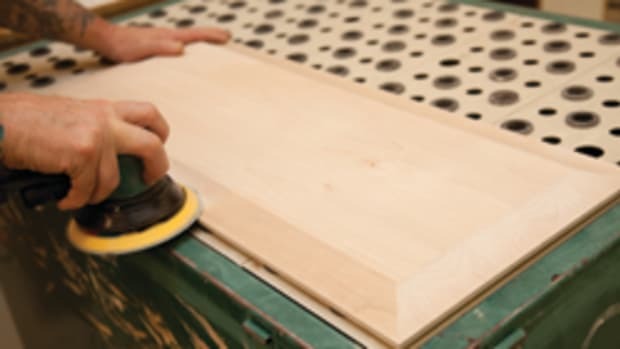 Sanding involves abrasion rather than cutting, so the residue is especially fine. As such, portable sanders are a primary source of migrant dust in most woodshops (as opposed to wide belt units that usually have sophisticated collection built in). Capturing fines where they are created can be done rather inexpensively and with technology that has been around for a long time. There are three elements and a shop that employs all three will enjoy significant success. The first is to use orbital sanders that have dust hoses attached. Small filter bags are essentially useless in a commercial environment because they fill very quickly and there is no mechanism that lets the operator know when the bag needs to be emptied and cleaned. The limited amount of filter fabric clogs in a very short time and no longer breathes effectively. There are many models of sander available with built-in hose ports and, while some are more effective than others, all are more effective than a bag or than not using anything. Look for models that don’t restrict the airflow too much: there’s not much point in attaching a sander to a large hose if the air has to pass through a very small orifice where it exits the sander and enters the hose. Sanding in front of the open end of a 4” hose doesn’t work well. To begin with, we are human and we tend to forget to move the hose. Secondly, that method just relies on undirected attrition — gulping huge volumes of air in the hope that the offensive particles will be collected. A sander attached to a hose, with holes in the paper that match holes in the base, is far more directed and effective. The second element in collecting at the source is to use downdraft tables. These augment rather than replace the sanders with hoses attached. In addition to extreme fines, a downdraft table also uses gravity to help collect larger particles. One problem with commercial downdraft tables is that they are often relatively tall, so it’s difficult to work on complete assemblies. An easy solution to that is to elevate the operator rather than lower the table: that is, one can buy or build a small deck or platform on casters upon which a woodworker can stand, so he/she can reach all parts of the cabinet. It doesn’t have to be too tall, maybe 18” or so. 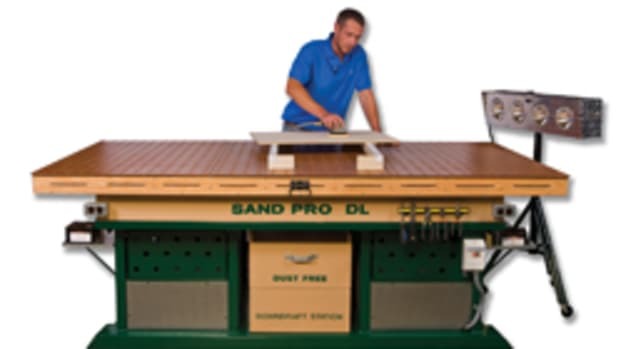 The third element is an overhead air scrubber that sits above every workbench where sanding will occur. These are relatively inexpensive, but they do require regular maintenance (filter cleaning or replacing). And they need to be turned on. If a woodworker is collecting dust above and below the work and also at the sander, migrant dust can be all but eliminated. An effective dust collection system includes a collection of practices and routines that must become habits on the shop floor. For example, a shop can institute a provision that team members must never use a pneumatic hose to blow the dust off cabinets. That only moves dust: it doesn’t collect it. Yes, it takes more time to tack down a surface than it does to blow it, but the latter only addresses an immediate problem and contributes to a long-term one. That dust will come back to haunt you. One-man shops often use shop vacuums rather than central dust collectors. In doing so, they exchange volume for speed. That’s not all bad, but it is essential that the shop vacuum is equipped with a filter bag or it will reintroduce some of those fines to the workshop environment. The bags need to be replaced often as they are not very porous and clog quickly. If an upgrade to a HEPA or high-performance filter is available, that’s a good idea, too. Larger shops need to inspect and maintain spark detection and suppression equipment on collectors. Failure to add this chore to a regular routine can allow combustibles to accumulate and create a much larger fire or explosion hazard. Local exhaust ventilation (LEV) is the trade term for an engineering system that can be used to protect employees and sensitive equipment (such as CNC computers) from hazardous fines. It involves machine-specific hoods, efficient and properly-sized ductwork (that reduces in diameter the farther it is from the collector), fans placed in the ductwork lines to maintain the cubic feet per minute of air being moved, filters to scrub air being released back into the shop and a discharge stack or vent to eliminate waste that has been filtered. Each of these elements needs to be easily accessed for routine cleaning and should be put on a schedule that ensures the cleaning is done. Monitoring the effectiveness of the dust collection system is a critical element that is often ignored. Areas where employees work should undergo routine or constant indoor air-quality assessment. Quantifying the amount of migrant dust in the shop air allows managers to set targets and meet them. With the revolution in electronics in the last couple of decades, numerous industries now operate clean rooms for component assembly. That means there has been a grand evolution in the science of airborne particle monitoring. Adding a particle counter to the woodshop’s dust collection system (or several portable units, strategically placed) is an element well worth considering. 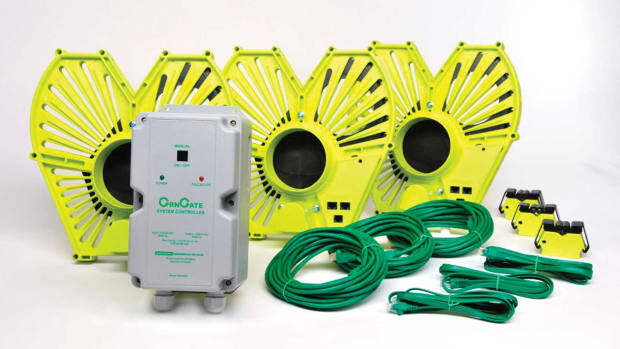 If migrant dust isn’t monitored and eliminated — or at least significantly reduced — it will stay in the shop environment and continue to cause problems for both products and people.